Every parent wants to feed their family the healthiest possible diet, and one way to accomplish this is to serve plenty of fresh fruits and vegetables. The question is, how do we accomplish this in a way that makes it convenient and easy to manage? One way is to grow it yourself, and if space is an issue or you simply don't want the hassles of tending a garden, fear not. There are a variety of foods that you can grow right in your kitchen that require very little space and are very easy to care for. You can also take pride in your powers of self-sufficiency and it's always nice to know where your food is coming from. What's really cool is that many vegetables can be grown from leftover table scraps. Just keep in mind are that these plants grow best with plenty of sunshine and water, and benefit from soil that provides good drainage. Includes basil, mint, and oregano. Many herbs grow like weeds. Take a few leaves with stems and place in water near a window. Once roots are about 2 inches long, transfer to a pot with soil and give it plenty of water and sun. Start carrots from seed according to the directions. Water the soil before planting and use a large pot to accommodate the roots, i.e., carrots. Place the pot in an area that gets plenty of sunshine and keep the soil moist, but not drenched. Seeds germinate in a couple of weeks. Carrots are ready to harvest when about 3/4 of an inch of the carrot is peeking out of the soil. Lettuce can be re-grown from kitchen scraps by simply placing the leftover stump in a half-inch of water. Place near a window that gets plenty of sunlight and check the water level daily. Onions can be grown from scraps, as well. Save the root side (the bottom) and leave it out until it is shriveled and dry to the touch. Place the onion in the soil root-side down and cover with 1-2 inches of soil and water regularly. Celery can also be grown from the unused stump. Place the stump upright in 1-2 inches of water. After 3-4 days, there should be small sprouts forming. Transfer to a pot and cover with soil so just a tiny bit of plant is peeking out. Place near a sunny window and water regularly. 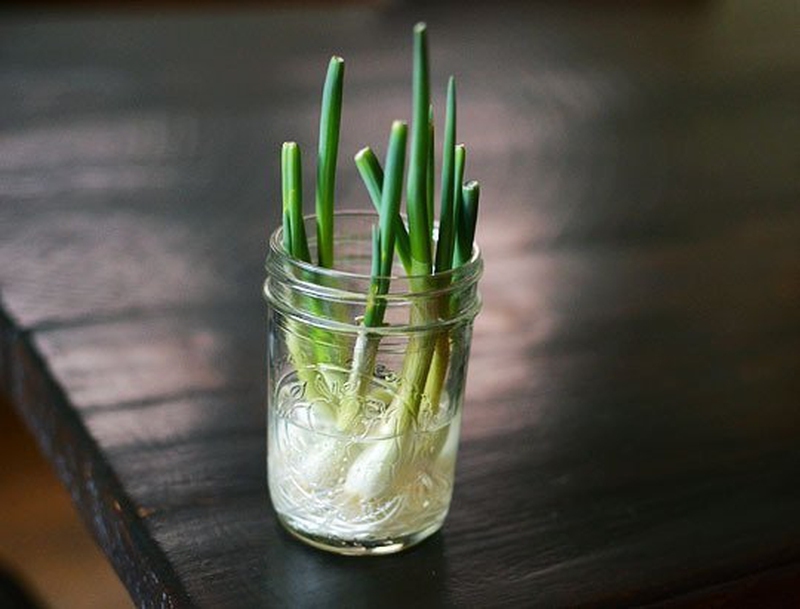 Place scallion roots in small 1 oz glasses that are half-filled with water. Place near a sunny window and change water every day. You should have full grain scallions in 1-2 weeks. These can be grown like scallions. Place water in a glass so that the cloves are just touching the water. Do not submerge or they will rot. Leave near a sunny window and change water when it gets cloudy. Harvest when shoots are 3 inches long. Choose smaller varieties to grow indoors. Start seeds according to the directions in small pots. When the seedlings sprout and are about 2 inches high, transfer to a larger pot (8 inch diameter), place near a sunny window, and use a climbing support as the plant grows. Choose roots with slight buds and break them into large chunks. Soak them overnight and then place just below the surface of the soil. Place pot near a sunny window and use a clear cover to promote humid conditions. Plants may take up to a year to yield ginger. Sprouting potatoes can be used as "seeds." Fill a glass with water and cut the potato in half. Use toothpicks to hold the potato up allows for about a 1/4 inch of submersion. Add water as needed and replace when cloudy. Transfer to soil when sprouts are 1-2 inches long.